Celebrities are known for enjoying the finer things in life, so it shouldn’t come as a shock that many of our favorite stars have an affinity for all things interior design. However, you might be surprised to hear that some of the hottest A-listers are also talented decorators. To prove our point, we’ve rounded up 10 celebs with a serious (but unexpected) knack for home design. From a rapper turned DIY-aficionado to a street artist with a flair for statement decor, this interior inspo has superstar cred. Turns out the queen of daytime talk—and breakout dancing—Ellen DeGeneres is also quite the house flipper. Along with her recently listed estate in Santa Barbara, she and wife Portia de Rossi have purchased, renovated, and sold nearly half a dozen homes in California over the past five years—including a posh pair of condos in Los Angeles, a $10M mansion in Beverly Hills, and a horse ranch in Thousand Oaks. And let’s not forget her wildly popular HGTV show, Ellen’s Design Challenge, where she flexes her decorating know-how on a group of up-and-coming interior designers. Kourtney Kardashian wears many hats—mom, spokeswoman, business mogul, and, of course, Kardashian sister—but her interior design expertise isn’t as widely known. However, take one look at her Instagram feed, particularly the posts of her black and white wallpapered former home, art-filled office, and daughter Penelope’s drool-worthy nursery, and you’ll find a whole new reason to follow Kourt. It seems that on top of being the cutest celebrity couple that ever existed, Emily Blunt and John Krasinski are also master house flippers. Starting with the rustic abode they bought, revamped, and sold in the Hollywood Hills three years ago, the pair have renovated more than half a dozen homes in the greater SoCal area—including a stylish, eco-friendly estate in Ojai and the stunning $6M pad in West Hollywood that Kendall Jenner purchased. As if we needed another reason to adore Diane Keaton, we go and find out she’s a renowned house flipper, design author, and home decor enthusiast. Along with the dozens of properties she’s flipped over the past three decades, the Oscar-winning actress has also written several books on architecture and interior design. Not to mention she’s one of the leading lifestyle pinners on Pinterest. Who knew Tobey Maguire was such a stellar real estate developer and renovator? In addition to the insanely cool house he just purchased in West Hollywood, the A-list actor flipped his $10M home in Brentwood and an uber-chic Spanish-style compound in Santa Monica—all for the love of design (and maybe the moolah). Though there’s little Miley Cyrus can do to shock us these days, hearing that her mom Tish and sister Brandi have a brand new design competition show, Cyrus vs. Cyrus: Design & Conquer, premiering on Bravo on May 25 is a bit more of a surprise. According to The Daily Dish, the series will focus on the pair’s proclaimed interior expertise, and, more specifically, their ability to revamp tricky spaces on a budget and on deadline. This is definitely a decorating show we don’t want to miss. 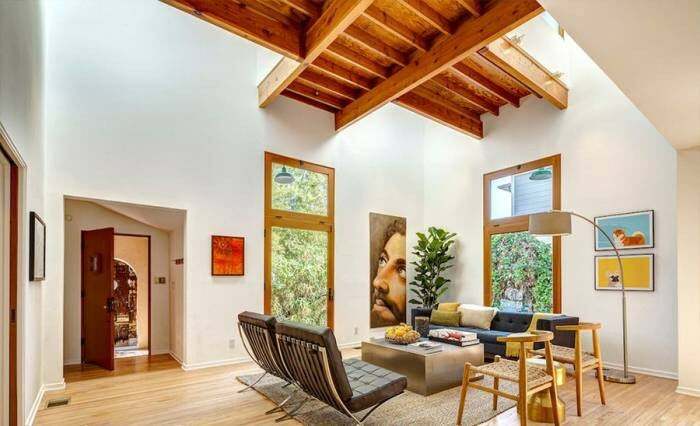 In addition to being a legendary rock star, record producer, and scarf-wearer, Lenny Kravitz has also mastered the art of interior decorating. Since launching his namesake design firm in 2003, Kravitz has taken on several notable design projects, including a furniture line for CB2, renovated condos in Miami, and, most recently, a luxury building—complete with backsplashes and travertine bathroom walls—in downtown New York City. Ever wondered what happened to Vanilla Ice after he stopped rapping? Seems that along with a couple major movie cameos, the performer successfully ventured into full-time house-flipping. He even earned his own design show on the DIY network. Too cool! While we’ve long admired street artist Banksy for his progressive artwork, we never knew he could turn graffiti into interior design until now. For one of his latest art projects, The Walled Off Hotel in Bethlehem, the anonymous artist helped redesign an entire hotel on the West Bank—complete with wall murals, broken televisions, and the “worst view in the world”—to make a statement about the politically-charged climate of the area. Last, but certainly not least on our list of design-savvy celebs is serial house flipper (and estranged Kardashian) Scott Disick. Along with revamping a seven-bedroom estate in Hidden Hills and his bachelor pad in Beverly Hills, Lord Disick will soon debut his very own renovating show on E! (as long as he stays in good standing with executive producer and ex-pseudo-mom-in-law Kris Jenner).